Is Biden’s ‘Handsiness’ Disqualifying? Wrong Question. Joe Biden likes bestowing physical affection on women he barely knows without asking their permission. This has not been open secret so much as an open fact. If you’ve paid close attention to American politics at any point in the last half century, you are probably aware that Uncle Joe is a “touchy” guy. But last Friday, former Nevada state legislator Lucy Flores asked us all to think critically about Biden’s “handsiness,” and to consider the possibility that it is actually insensitive for a powerful man to impose himself physically on less powerful women — no matter how “paternally” — and that a culture that treats such behavior as normal might be a less than ideal one for women to live in. New York’s Rebecca Traister, meanwhile, argued that Biden’s failure of empathy in his interaction with Flores was indicative of a broader insensitivity toward women, one that informed the former senator’s maltreatment of Anita Hill and his past betrayals of the pro-choice movement. 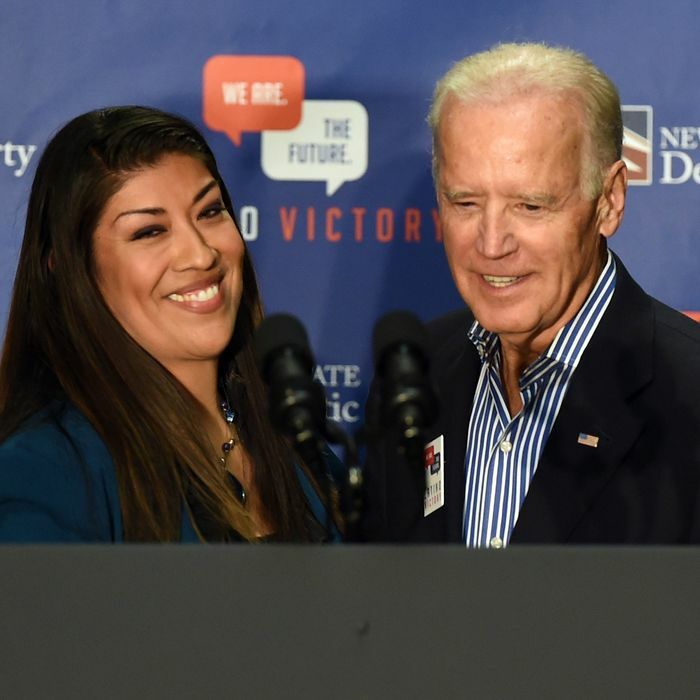 In the days since, we’ve learned that Flores is not the only woman who found Biden’s embraces inappropriate, and that the former vice president once (reportedly) rested his hand on the thigh of a college student who had just publicly shared her story of suffering sexual assault. All this has generated a fair amount of productive discussion and good-faith debate. It has also triggered a conversation about whether or not Biden’s behavior is “disqualifying.” Confronted with that question during a live interview with Politico Tuesday, Nancy Pelosi said that she thought it wasn’t. Bernie Sanders endorsed a similar principle Sunday, telling CBS, “I’m not sure that one incident alone disqualifies anybody.” (At that time, only Flores’s account was public). In truth, asking Democrats whether Biden’s behavior is “disqualifying” merely allows them to avoid confronting the issue by disavowing a straw man. I don’t think anyone has argued that Biden’s actions toward Flores were so beyond the pale that Bernie Sanders and Nancy Pelosi could not allow him to enter the Democratic primary. And if Biden’s conduct does not rise to that level — and the Democratic primary is a (small-d) democratic contest — then the only entity with the authority to decide whether or not Biden is qualified is a plurality of Democratic voters. Thus, the question isn’t whether Biden’s behavior is disqualifying, but rather, whether it is telling or worthy of censure, in the opinion of Sanders and Pelosi. Similarly, I don’t want to know whether Elizabeth Warren sees Biden’s support for bankruptcy reforms that hurt consumers, an Iraq War that killed hundreds of thousands, or mandatory minimum sentencing laws that fueled mass incarceration as “disqualifying” — but I’d be curious to hear how she believes voters should evaluate that record, or whether she thinks Biden should be the last choice for voters who care about social and economic justice, or what she thinks Biden must do to demonstrate that he has learned from his mistakes. All of this may sound pedantic. But the word “disqualifying” already proved its talent for obscuring and toxifying intra-Democratic debate in 2016. During the final leg of that year’s primary, Hillary Clinton’s camp aired skepticism about Bernie Sanders’s qualifications for the presidency — which led the Vermont senator to take off the kid gloves for the first time, and ask Clinton, rhetorically, “Are you qualified to be president of the United States when you’re raising millions of dollars from Wall Street, whose greed and recklessness helped destroy our economy?” Sanders suggested that the answer to his query was no. And yet, the most egregious forms of misconduct not withstanding, whether we find any given politician’s actions intolerable is inescapably contextually dependent. In reality, Sanders did not actually think Clinton’s friendliness with Wall Street rendered her irrevocably “ineligible” or “unfit” for the presidency — only less fit than himself. Once the 2016 contest became a choice between Clinton and Donald Trump, Sanders not only maintained that his former rival was qualified for the Oval Office, but that his supporters were morally obligated to help put her there. So: Let’s stop describing the Democratic primary like its meritocratic competition for a job at a white-shoe law firm and start treating it like a democratic contest for a major-party nomination. Don’t ask Nancy Pelosi if Biden’s groping habit is “disqualifying.” Ask whether a habitual groper who played a leading role in the failure of school desegregation, the character assassination of Anita Hill, the decimation of bankruptcy protections for millions of consumers, the rise of mass incarceration — and the biggest foreign policy disaster in modern American history — could plausibly be the best that the Democratic Party has to offer.